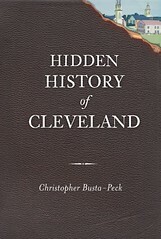 Cleveland Area History: The New Cuyahoga: A Proposal to Straighten the "Crooked River"
1) Speed the flow of pollutents into the shoreline of Lake Erie. And can you imagine the erosion that speeding water would have caused? 2) Lead to the restoration back to the original path. One thing we humans do too frequently is come up with these logical, and expensive solutions to Mother Nature's inventions, only later to see the error of our ways and spend even more money to fix our original "fix" to something not broken. A few years ago when a time-capsule was opened, a note was inside that asked "Did you ever find a way to straighten the river?". Wish I could remember more details about the time capsule but it shows their feelings of the importance of the issue at the time.